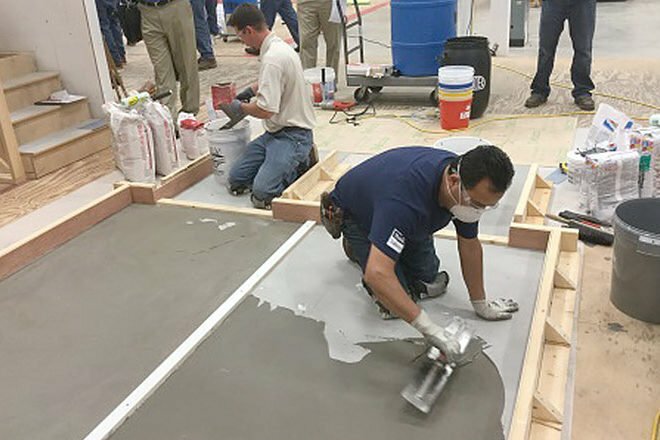 The INSTALL Surface Prep Certification test run hosted at the Wisconsin Carpentry Training Center was a success! This new program was created to address the significant need in the floor covering industry to raise awareness and aptitude of substrate needs for successful installations. Substrate awareness is part of every installation and this certification already has great implications in our daily success. This rigorous evaluation includes a 100-question written test, profiling, moisture and alkalinity measuring and mitigation, ramping, self-leveling, skim coating, mixing and cleaning expertise. Instructors, applicants and 11 mills collaborated to review the curriculum and testing. New INSTALL Warranty Contractor, Building Services Inc (BSI), supplied the contestants and is now the only contractor in the world with INSTALL Surface Prep certified installers. We look forward to future Surface Prep Certification events.